The last couple of days on the ‘patch’ there have been plenty of grounded migrants after the weekend’s bad weather. On Friday late afternoon / evening there was torrential rain with thunder & lightening so the signs were good for migrating birds to have been stopped in their tracks. I was not disappointed with large numbers of birds being seen. 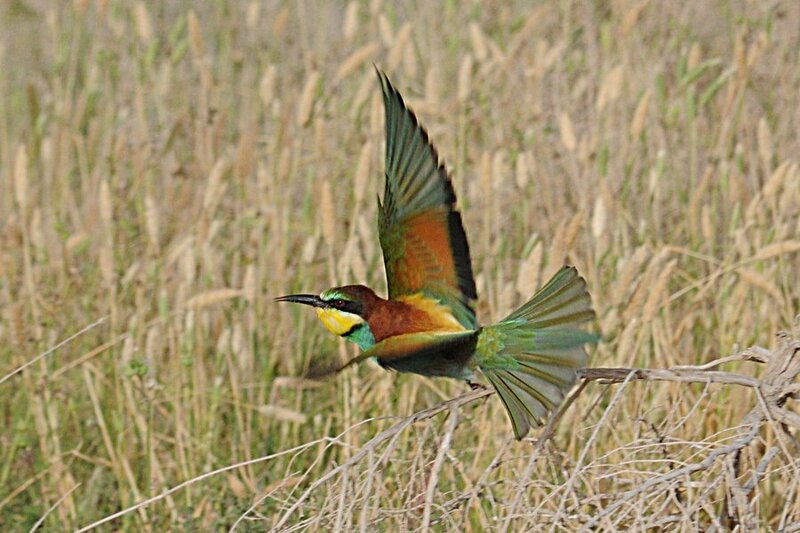 The first indications of the number of birds were small flocks of European Bee-eaters flying about catching insects. 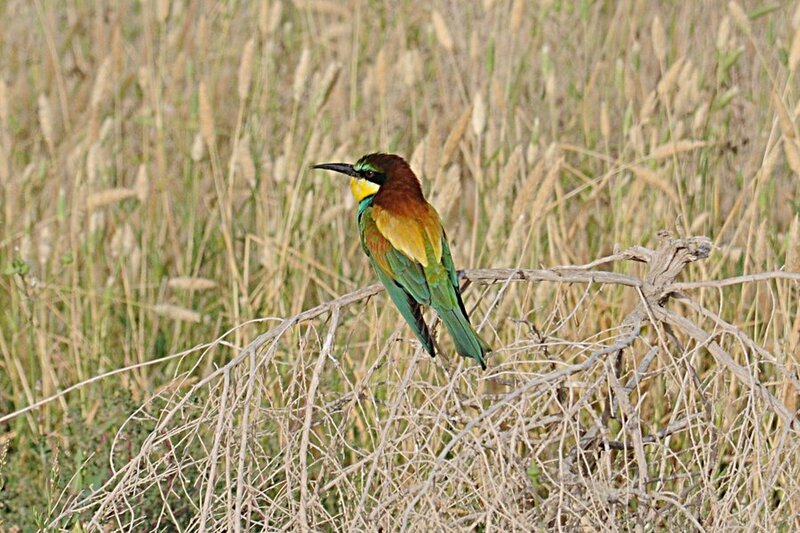 Although there were hundreds of European Bee-eaters in total there were still only a couple of Blue-cheeked Bee-eaters present. I drove over the scrubby desert area hoping for wheatears and Rock-thrushes but saw only a single male Pied Wheatear. I then carried on to the percolation pond where I saw a group of 13 Common Sandpipers that had been grounded and were all feeding actively together on the best wet edge of the pond. There was very little else on the pond but 50+ Barn Swallows and 25+ Sand Martins were hunting over the pond. There was a large passage of Common Swift with small numbers of birds passing over for the entire time I was at the pond and there must have been 300+ birds in total. The Black-winged Kite was still present perched in the dead trees at the edge of the pond and later seen hunting over the spray fields. A walk around the pond & spray fields produced 15 Barred Warblers, 50+ Willow Warblers, seven Lesser Whitethroats, five Eastern Olivaceous Warblers and a single male Eurasian Blackcap. A single European Turtle Dove was sitting in a small tree next to a nice male Turkestan Shrike. 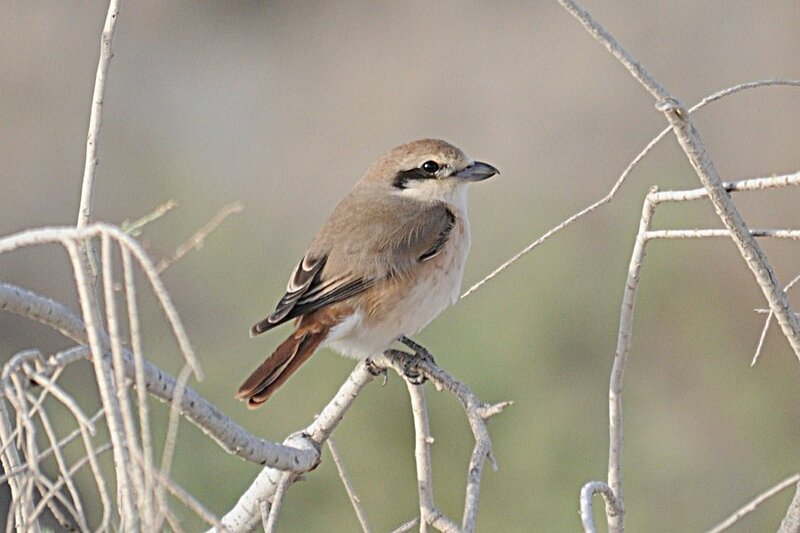 Shrikes were still around in reasonable numbers with seven Turkestan Shrikes, four Daurian Shrikes and the year’s first Masked Shrike (for me) but no Woodchat Shrikes were seen. Four Common Redstarts, three males and a female, were around the edge of the pond and two singing male Clamorous Reed Warblers were in full song in the newly re-growing reed beds. A fine adult male Black-headed Yellow Wagtail (M.f.feldegg) was showing well on the edge of the pond. The spray fields themselves had good numbers of Red-throated Pipits with up to 50 seen and six Tree Pipits were also located. The year’s first Ortolan Buntings were also seen with at least seven birds seen but possibly many more as the birds were very flighty and I didn’t want to double count any so just counted the most I could see together at any one time. The last bird of the day was a Eurasian Wryneck seen in the same place as I saw my first bird on the camp a couple of weeks ago. This one was a little bit more confiding and I got a slightly better, although not brilliant, photograph of it. We had heavy rain last Wednesday in Riyadh and had a similar windfall of birds. Looks like you had a great day's birding. Also like you most of our passage wheatears have gone. I would love to see a turtle dove like you photographed. They are very rare here these days. I am envious over the barred warblers too. Presumably they were in the tamarisk? 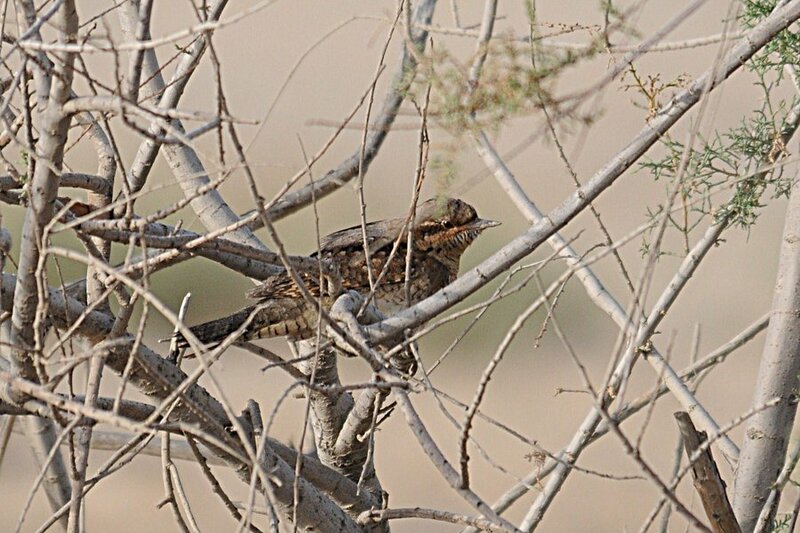 The Barred warblers were mainly in the tamarisk but also in acacia trees. There are still penty about today as well as a few more European Turtle Doves. Barred Warbler is common here but has a very short migration period of a couple of weeks only. 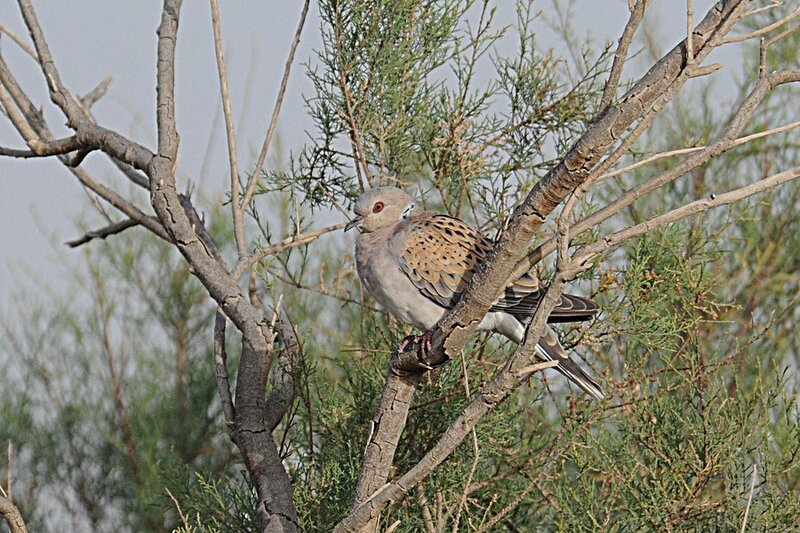 European Turtle Dove breeds here so although migrants they then stay until autumn in small numbers.